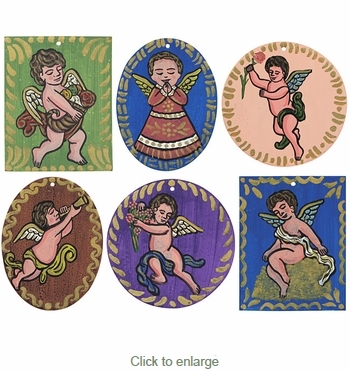 These hand painted tin retablo ornaments with various angels will bring a charming antique feel to your holiday decorations. These Mexican retablo ornaments are handmade and individually painted on both sides by folk artists in Mexico. Price is for a set of two ornaments. We will select from our available assortment.